Hon kudzu starch noodle using 100% domestic real kudzu powder. Use for Japanese nabe (Japanese stew), vinegared dish or salad. Or eat as cold sweets together with Sambaizu (vinegar, soy sauce and mirin (or sugar) mixed in roughly equal proportions) or with black sugar syrup. This is sticky and tasty hon-kudzukiri using only non-chlorinated kudzu starch. This has chewy texture and it does not melt even though it is boiled for long time. This strong texture is produced by the skill of 450 years of traditional way as it is and the ingredient; 100 percent of naturally dried hon-kudzu powder. This is made to crush and squeeze the juice from the roots of natural kudzu coming from Kinki, Shikoku and Kyusyu area, and to immerse the juice in ice water in the frigid winter time, and then dry it naturally to take time slowly. The specific texture of hon kudzu gives smooth feeling when you eat it. This is important food to maintain Japanese traditional food succeeded the taste from old ages. 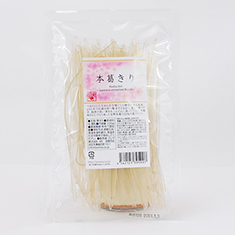 Put this Kudzu kiri noodle into enough amount of boiling water and detangle it with chopsticks, then boil it for about 20 minutes as your favour. Soon it is done boiling, drain in a colander and take under running water. For Nabe (Japanese stew), soak it in hot water for 20 minutes to be soften. *Be aware of boiling over when you boil it. Take well attention not to get burned by hot water. * For eating as sweets, eat together with Sambaizu (vinegar, soy sauce and mirin (or sugar) mixed in roughly equal proportions) or black sugar syrup. Also good for salad like Harusame. You can arrange Korean cold noodle with Kimuchi. For the ingredient of Nabe (Japanese stew) in winter time.